Blood endothelial cell types, origins, and culture. Circulating endothelial cells (CEC) are detached from the vessel wall endothelium as the result of injury and/or disease. Blood outgrowth endothelial cells (BOEC) have all the characteristics of mature endothelial cells. They seem to be progeny of endothelial colony–forming cells (ECFC), a marrow-derived progenitor that resides both in blood and within in situ endothelium. 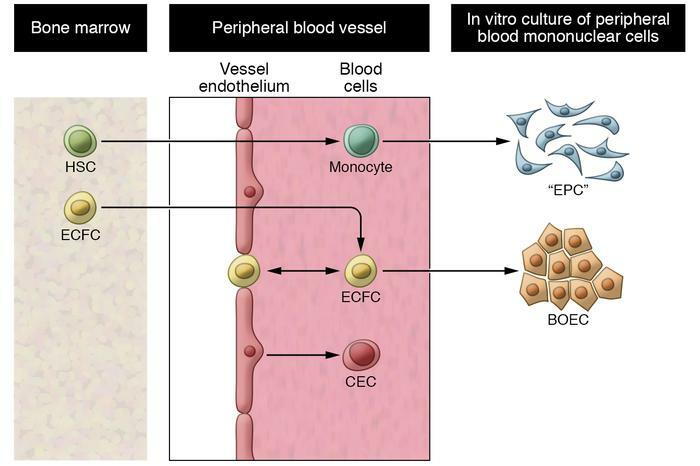 The other relevant cell appearing from appropriate culture of blood mononuclear cells was labeled “EPC” (intended for endothelial progenitor cells). These were later shown to be of hematopoietic stem cell (HSC) origin.